This is a four-week online learning program, designed for team leaders (new, experienced and aspiring). This is the second of the Teams365 Team Leadership Foundations program. This program is offered in-house. 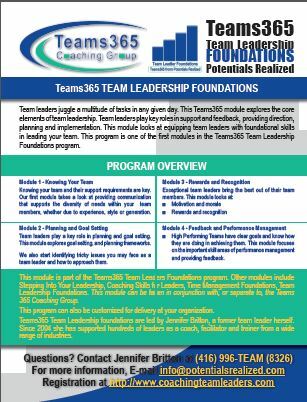 This Teams365 module explores the core elements of team leadership. Team leaders play key roles in support, providing direction, planning and implementation. This four-part program looks at equipping team leaders with foundational skills in leading your team. The program consists of four one hour calls held on a bridgeline, led by author and Teams365 master facilitator Jennifer Britton. This is one of eight online learning courses around the foundations of Team Leadership including Coaching Skills for Leaders, Stepping into YOUR Leadership, Facilitation Skills Foundations, and Emotional Intelligence. This program can also be customized for delivery at your organization. The program is facilitated by Jennifer Britton, host of the Teams365 blog. Jennifer is the founder of Potentials Realized, a performance improvement company focusing on leadership and teamwork. Jennifer is a former team leader with the United Nations, and has led global, virtual and multicultural teams. For the last 10 years, through Potentials Realized, she has supported hundreds of teams and leaders expand their skills and insights through engaging training, coaching and facilitated sessions. Jenn is known for her expertise in the area of group and teamwork and is the author of Effective Group Coaching (Wiley, 2009) and From One to Many: Best Practices for Team and Group Coaching(Jossey-Bass,2013), and Effective Virtual Conversations (2017). Her first two books have been adopted by coach training schools and university programs to train new generations of professional coaches. 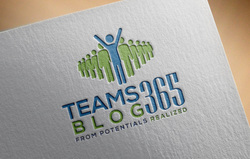 Check out Daily Tips, Questions and Quotes for Team Leaders at the Teams365 blog. 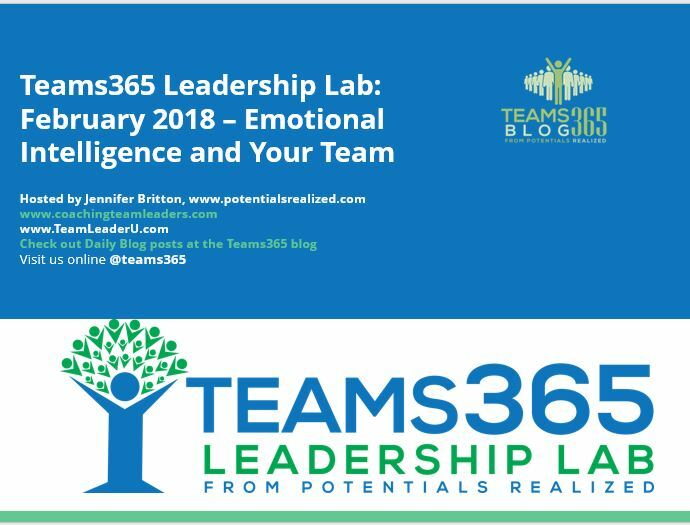 During 2018 the Teams365 Leadership Lab meets on the 2nd and 4th Fridays of each month between 845 - 930 am ET.